I can not tell you how bad I wanted a Chan Luu bracelet. But having boxes of beads, I just could not bring myself to buy the bracelet…no matter how cool it is. 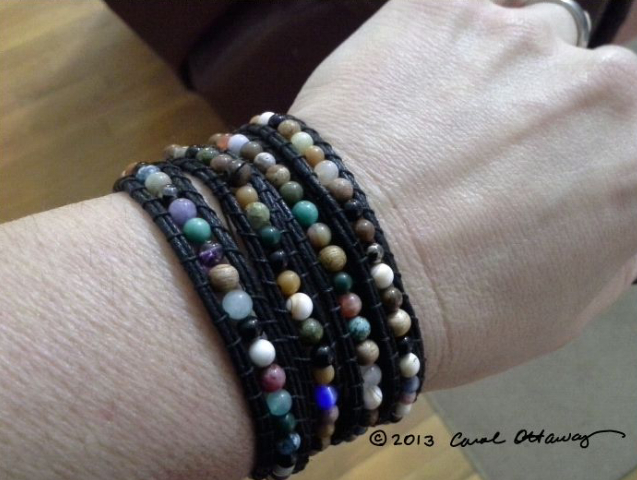 Since, wrap bracelets are so popular, I was hoping to find some instructions to make my own. I tell you, if it was not for YouTube I would not know how to do anything, LOL. I searched YouTube for a couple of days, trying to find a video that was simple enough that I could follow the instructions. After a lot of searching, I found the video below. I thought I would post this just in case you would like to make your own. Be Well and Happy Wednesday! 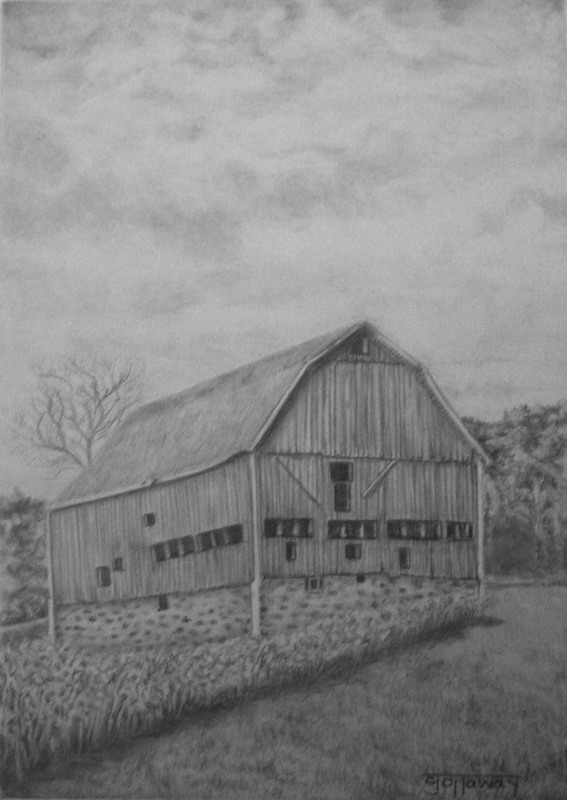 I put everything I have learned over the past few months and I was able to complete this drawing. Maybe I did get a little ahead of myself, but now I have a good grasp of landscapes and buildings. I feel much better about my upcoming commission of an old homestead which worried me to no end and it never hurts to expand your portfolio, right? This is the only drawing that I have, but I’ve been very busy in my absence. I have been preparing for an arts and crafts show. Believe me when I tell you, that I am not a crafter. So this has been a difficult experience, but it’s also a good opportunity to sell my art. So I’m sucking it up and making a few crafts as well as selling some of my prints. I’m back!! I know it’s been a while, but with the upcoming holidays my posts will be sporadic. I have been pretty busy and trying to find some Christmas spirit! 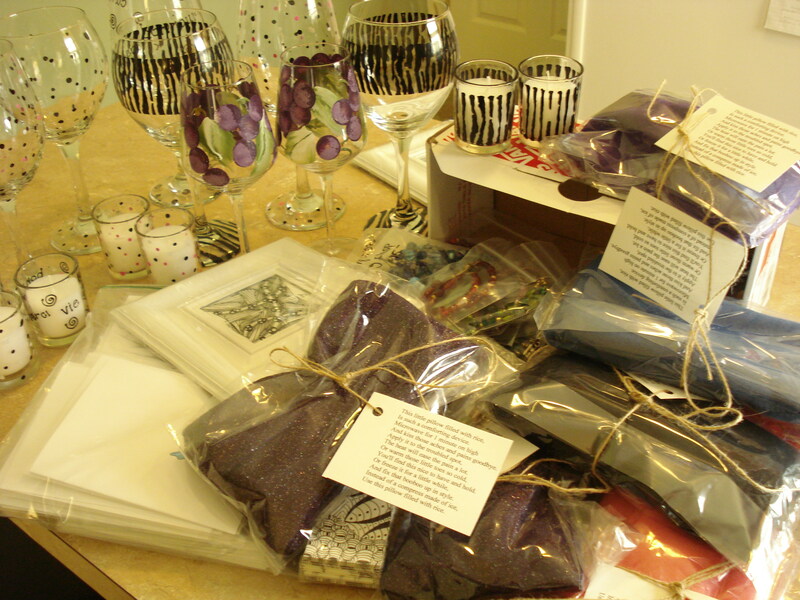 I have been making Christmas goodies that have been loads of fun and seemed to be a good place to start. I have no idea what I’m going to do with 10 loaves of Icebox fruitcake though. I hope it can be frozen. I have two Christmas favorites Applenut Cake and Icebox fruitcake. It’s doesn’t feel like Christmas without them. I didn’t bother with making the cake, because nobody makes it like my mama and she makes my sister and I one every year for our birthday:) One year she even sent us one UPS! I did make her icebox fruitcake and man that stuff is gooood! It’s more candy than cake and it’s yummmmmy! Then, I have been making David and Alana watch every sappy Holiday movie I can find from Lifetime, Family and Hallmark channel which is an awesome payback! I guess next comes putting up my ugly, sad little tree that no one wants to decorate, but me. It’s like living with two rocks. Anyway, on with the bracelet… It was so simple. 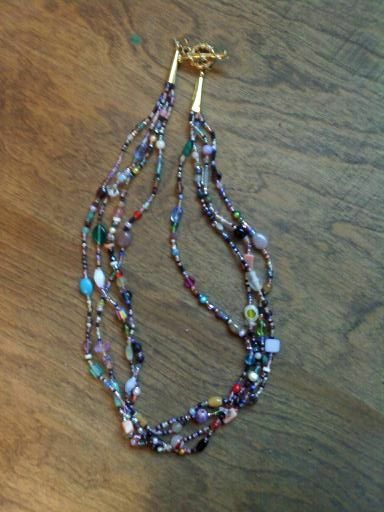 I just used memory wire and beaded vintage pearl beads from my stash. I didn’t have any end beads so I just bent the ends. I think pearls are elegant on their own and should be made with a simple and light designs. 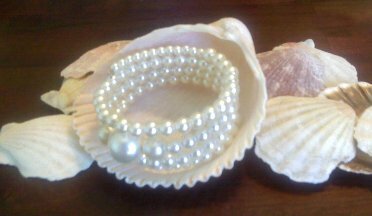 I loved using the memory wire because it gave the illusion of small strands of pearls, but could wrapped it on and off of your wrist, which I think is pretty much the style these days. The bracelet is part of a Christmas gift and I think I’m going to wrap it around the present like a bow. I hope she like it. 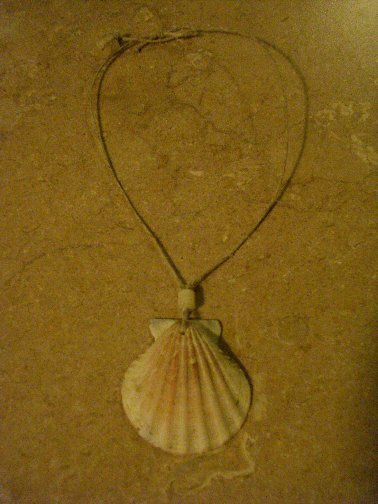 This is a necklace that I made for my niece. I’m not worried that she’ll see this post, because her auntie’s blog isn’t cool like texting, Facebook, My Space, You Tube or whatever the heck teens do these days. 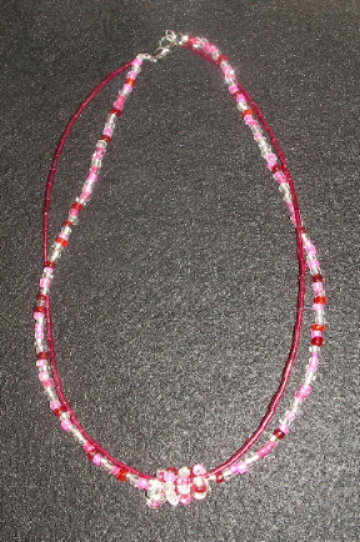 The necklace is beaded with hot pink tube beads and the larger seed beads in clear, white, hot pink and red. The ornament in the center is the same seed beads coiled around both strands with scrolled ends. The findings are just 2 jump rings and a sterling lobster clasp. I hope she likes it. I hope everyone has a creative day! I thought I’d do a little beading for AEDM. 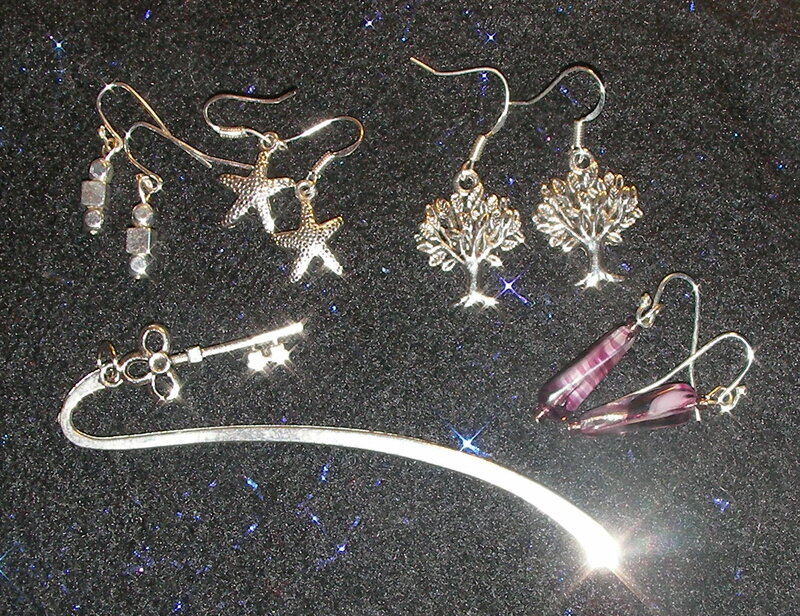 The tree of life, star fish, key and some findings were a present from my friend. The hook is a bookmark. My favorite pair is the purple stone set and they will go right into my jewelry box after this post. Well, I guess this is another short post. :) Enjoy your creative day!